Time For An English National Anthem? 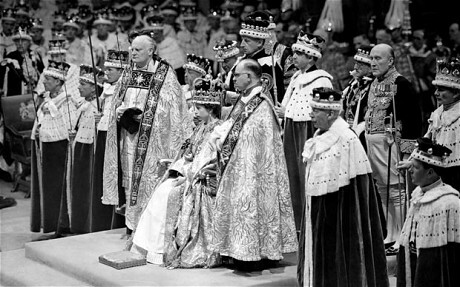 Is it time that England asserted herself by choosing a new national anthem of her own, separate and distinct from “God Save The Queen”, which supposedly represents our whole United Kingdom? MPs seem to think so – the House of Commons has just voted in favour of an English national anthem, with a strong movement emerging to make Jerusalem England’s new anthem. But was Chesterfield MP Toby Perkins right to table the motion in the first place, and would we be right to ultimately adopt his idea? In short, no. Much as this blog is generally in favour of full parity between the four home nations – best expressed through a federal structure brought about as the result of a full constitutional convention – calls for a separate English national anthem are particularly unhelpful at this time. Our United Kingdom is already fraying at the seams. Having narrowly avoided dissolution as a result of the Scottish independence referendum last year, now is hardly the time for further measures which emphasise the relatively slight differences between England, Wales, Scotland and Northern Ireland. And no matter the temptation to poke swivel-eyed Scottish nationalists by meeting their quasi-religious fervour with a matching level of English nationalism, any step in this direction is likely to do more harm than good. Is “God Save The Queen” a great anthem? Sadly not. Though as one commenter said on the BBC Daily Politics last night, it would have sounded less turgid sung lustily and at twice the speed, as apparently it once was. But there is no escaping the fact that Britain’s national anthem is a dusty and somewhat dull affair, especially set against the rousing, martial Marseillaise, the strutting, operatic Italian anthem or the ever-inspirational Star-Spangled Banner. The hushed opening, stately and noble tempo and beautiful harmonies, slowly building to an impassioned climax in the (too rarely heard) second verse, “Thy choicest gifts in store…”, actually make those who have only ever heard bad recordings of our national anthem stop and reconsider its merit. And this sense of a fresh look is possible with contemporary performances too. We all know how the Americans pinched the tune to our national anthem and rebranded it as a patriotic song entitled “My Country, ‘Tis Of Thee“. Well, in the right hands it can sound incredibly moving – again showing that we British fail to make the best use of the source material at our disposal. Yes, that amazing performance which had you on your feet was none other than “God Save The Queen”, re-branded and given a glitzy makeover by a people who are a bit less hesitant to wear their emotions on their sleeves. Once again, we could learn a thing or two from our American cousins. But of course, there is no escaping the fact that the words of Britain’s national anthem are written to glorify one person – the monarch – rather than our country itself, or her people. For some with republican leanings, it is impossible to get past this obstacle, whatever their other feelings on the subject. I can sympathise with this position. But as someone who greatly admires the Queen, has enormous respect for our country’s history and heritage but who increasingly thinks that the monarchy should be gently separated from our constitution once the second Elizabethan age is over, I still sing our national anthem with pride, thinking of my country rather than just my Queen. The temptation to meddle – to change things, supplant or supplement them – is always going to be present, because nothing we do or create will ever be perfect. But “God Save the Queen” has been with us since 1745. It is very much a part of our history. In the past year alone it has seen us through two world wars, a cold war, as well as technological and social revolutions which have utterly transformed Britain – nearly always for the better. Could we adopt Parry’s “Jerusalem” instead? Yes, of course. Nobody doubts that it is a fine composition, with a century of its own history and lyrics – it is a setting of a poem by William Blake – in its favour. It also has the advantage of glorifying a country, or at least an idea of a country, which is what national anthems are if anything supposed to do. But is the satisfaction we might feel by doing so worth adding to the factors which are undermining our United Kingdom from within and without? Is taking what would be a very bold step toward the reassertion of separate English identity worth potentially destroying our union. I do not think so. Should we change our national anthem, or create a new anthem specifically for England? Absolutely not. Not now. We should just make much better – and more musical – use of the anthem we already have. This tribute, offered by a Telegraph reader on the occasion of Queen Elizabeth II becoming Britain’s longest reigning monarch, is poignant and undeniably true. Every British person born over the past six decades has known no other monarch, seen no other figure represented on their currency, celebrated no Christmas without the Queen’s annual message to her people. In hundreds of small ways, the Queen is part of the fabric of both our individual lives and also our shared national life. Presented with a blank sheet of paper, nobody would design a hereditary monarchy as the preferred mechanism for producing a ceremonial head of state. And yet it has worked tolerably well for Britain, particularly these past couple of centuries. The head says that a federal system with an elected head of state would make far more sense – fairer, logical, more egalitarian and less of an anachronism than the curiosity which is the British monarchy. The head says that pledging allegiance to a person rather than a flag or a constitution is quaint at best, and downright dangerous at worst. The head clamours for a constitutional convention and the bold re-imagining of the twenty-first century state. But not so the heart. The heart is glad for what we have, odd though it is by modern standards: the capsuled history of our country represented by a single person of flesh and blood. The heart looks with pride and gratitude on the lifetime of service dutifully performed by Queen Elizabeth II – a role never democratically bestowed, but fulfilled far more faithfully and proficiently than can be said of many an elected official. And the heart shudders to think what would become of Britain if our head of state was drawn from the same pool of glib, superficial careerists as many of our politicians. The day will come – not, we pray, for some years yet – when we will have to face these issues and reshape our country for a new age, looking the future square in the eye. But not today. Today, we can be thankful for a duty faithfully discharged for 63 years and counting. An anachronism, yes, but still an example to us all.